Click on the cover image to download the document. Due to geography and geology as an island, the Province of Bohol is exposed to numerous natural and human-induced hazards. A major event that has put the province in the disaster map was the 7.2 magnitude earthquake on October 15, 2013. That disastrous event, which is now called “The Great Bohol Earthquake of 2013,” has caused extensive damage to service infrastructures, government facilities as well as centuries-old religious structures declared as national cultural treasures. The earthquake event, though disastrous and devastating, has brought a deep sense of awareness and realization to the Boholanos, led by the indefatigable Governor, Edgar M. Chatto, to work together to “build back Bohol Better,” and prepare a local disaster risk reduction and management plan for the Boholano communities to be more resilient and prepared for whatever disasters. The province is also vulnerable to natural disasters, e.g. drought, storm surges, tsunami, flooding, earthquake, tropical cyclones and landslides. 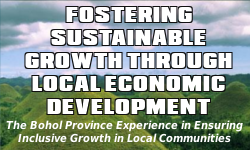 As such, the province has been incurring significant economic and environment damages from disasters. It is estimated that these damage incurs Php 14 Million at an average annual direct damage, reaching a total of Php 69 Million from 2004 to 2008.
Notable calamities that hit the province include earthquakes, flash floods in the towns of Clarin, Tubigon, Loon and Calape; landslides in Balilihan, Loboc, Alicia, Cortes, Jagna, Sierra Bullones; sever significant damage to agricultural assets. Man-made calamities were also recorded during the period ranging from fire incidents, diarrhea outbreak and sea mishaps. 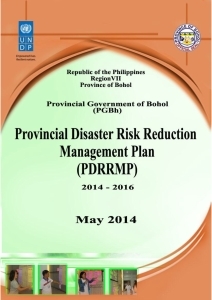 The Bohol PDDRM Plan envisions a “disaster-resilient, climate change adaptive and safe Boholano communities with a strong spirit of stakeholder commitment guided by effective local governance ensuring social protection, economic security and social-inclusive disaster management towards sustainable development. Good day. Would your good office have a map of the recognized evacuation areas in the province? I saw this masterlist from DSWD. Thank you and best regards. Hi Michelle, I don’t have the data on location. I only can get a list but the the geographical locations, so I can’t map it out. I’ll just update the maps collection when I can get the needed data.